(Reuters) - At least three people were killed on Saturday and 35 injured after protests turned violent in Charlottesville, Virginia, as white nationalists protesting plans to remove the statue of a Confederate general clashed with counter-demonstrators and a car plowed into a crowd, officials said. A 32-year-old female was among those killed, said Charlottesville Police Chief Al Thomas, and injuries ranged from life-threatening to minor. The male driver of the vehicle that plowed into a crowd is in custody, Thomas said, and police were treating the incident as a criminal homicide investigation. Police also confirmed that a 20-year-old suspect named James Field had been arrested in connection with the car crash and was being held by authorities on charges including second degree murder. Police confirmed that at least nine people were being treated for injuries, including some that were life-threatening, with five people in critical condition and four in serious condition. Dozens of others were injured in other violent clashes between protesters and counter-protesters during the day. The clashes prompted the governor to declare an emergency and halt the rally, and President Donald Trump condemned the violence. The driver of the car has been taken into custody, according to numerous reports. "I am heartbroken that a life has been lost here," Charlottesville Mayor Mike Singer said on his Twitter feed. "I urge all people of good will - go home." Video on social media and Reuters photographs showed a car slamming into a large group of what appeared to be counter-protesters, sending people flying into the air. The City of Charlottesville said 15 people were injured at the site of the rally. "We're closely following the terrible events unfolding in Charlottesville, Virginia," Trump told reporters at his New Jersey golf course. "We condemn in the strongest possible terms this egregious display of hatred, bigotry and violence on many sides." A reporter shouted a question to Trump about whether he had spoken out strongly enough against white nationalists but the president made no comment. The clashes highlights a resurfacing of the white supremacist movement under the "alt-right" banner after years in the shadow of mainstream American politics. 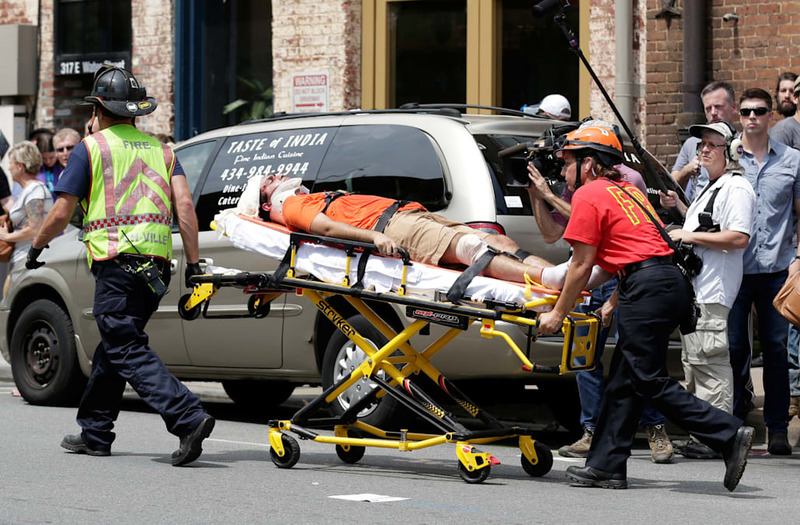 Tensions in the city intensified when the vehicle plowed into a crowd of people gathered in a street two blocks from the park that houses the statue of Robert E. Lee, who headed the Confederate army in the American Civil War. The Charlottesville confrontation was a stark reminder of the growing political polarization that has intensified since Trump's election last year. A video shown on CNN showed a silver sedan driving at high speed into the crowd before reversing along the same street. "From what I saw, it looked extremely deliberate," Will Mafei, 23, of Charlottesville said. He also witnessed the car hitting pedestrians as it went in reverse. Earlier, Virginia Governor Terry McAuliffe declared a state of emergency in the city, home of the University of Virginia's flagship campus. The gathering was declared an "unlawful assembly," allowing police to disperse the protesters, and police cleared the park where the rally was to be held. "I am praying that God help us all," Vice Mayor Wes Bellamy said in an interview with CNN. "We are better than this."